I attend church ONLY on Sunday mornings! I remember when I was first “born again” and for many, many years Gary and I attended church every–time–the–church–doors–were–open! Sunday morning. Sunday night. Wednesday night. Weekly Bible study. Ladies Bible study. Couple get-togethers. Family get-togethers. Plus other activities throughout the month. Gary and I both worked, YET, we did not live busy lives; WE LIVED BALANCED LIVES. There was work and there was play – by God’s grace – our hearts were stayed upon Almighty God all day. I think the most natural thing happened when we spent that much time with God and His people. Our lives overflowed with His Love-Letter ways. From praying in the morning at breakfast…to praying with the boys at bedtime…to praying without ceasing. To loving the people God brought into our lives and onto our journey path. Even though most churches today, their doors are not open as often as they used to be––I HAVE GOOD NEWS FOR YOU AND FOR ME! WE CAN BOLDLY COME TO THE ETERNAL THRONE ROOM OF GOD ANY TIME, 24/7, AND HAVE AN “AA MEETING” an ALMIGHTY’S ALIVE MEETING.! I do want to clarify. Let me make it clear–I am not against Alcoholic Anonymous meetings (my mother-in-law was sober for years and faithfully attended meetings). I am for Celebration Recovery and also Teen Challenge (my sister is a graduate of Teen Challenge and has been sober for 14 years and counting!). AND GUESS WHAT? I’ve come to realize, for me, without an AA Meeting everyday with my Jesus–no matter how often I attend church–it would not be enough. I need to be reminded again & again & again that God Almighty’s Alive – Because the dust of this world has a tendency to cling to me – this clay pot – like I’m a dust magnet. I thank my God for His beautiful Love-Letter–THE HOLY BIBLE–because each time I read the God Words – I attend an AA meeting – Almighty’s Alive meeting with Him. His still small voice whispers to me as I read the God Words, and I am reminded again & again & again who He is, who I am, and what He has done for me. And we talk Friend to friend. ATTENDING CHURCH IS IMPORTANT WHETHER IT’S ONCE A WEEK OR MORE OFTEN. Our children and grandchildren are watching! PLUS OUR ATTITUDE ABOUT ATTENDING CHURCH IS IMPORTANT…ARE WE EXCITED ABOUT GOING TO GOD’S HOUSE OR NOT? Our children and grandchildren are watching!As our children and grandchildren see that we are excited about attending church, I believe it has an impact on them, and they’ll be excited about attending church, too. Yes, attending church is important! And as I share with you each month–something else that is vitally important and has an impact on our loved ones–is our prayers. Click on the Calendar and it enlarges in a separate window so that you can see the scripture references clearly. Your prayers are powerful! And a powerful way to pray is by praying scriptures. 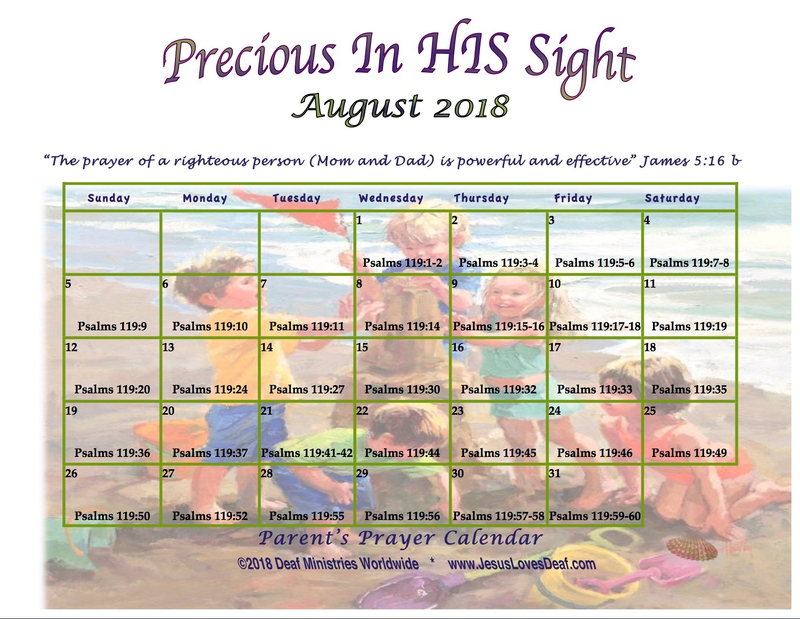 Click on this month’s Precious In HIS Sight Scripture Prayer Calendar and it enlarges in a new window making the references easy to read. The Calendar helps me faithfully pray for my loved ones. Everyday, I look up the verse on the Calendar and find the scripture reference in my Bible. Then I turn the verse into a prayer for my family. I print the Calendar and keep it in my Bible. I encourage you to do the same. I have many thoughts on my heart…about…The Church, Family of God, prayer, and this journey that Abba Father has me on – this AA – Almighty’s Alive journey. I’m not sure where this journey is leading me, however I’d love for you to join me. I am in the process of starting a blog website titled “Almighty’s Alive”. I’ll let you know when it is up and running on the internet. “My soul follows hard after God” (Psalm 63:8, KJVa). “As the deer pants for streams of water, so my soul longs for You” (Psalm 42:1). Lord, help us follow hard after You, long for You, pant for You, desire You. In Jesus Name. AMEN. Dear Rhonda, thank you for the Prayer Calendar and I printed it. I do use them for prayer guide. Your pictures are awesome and blessings. It reminds me of what God quoted, “Be fruitful and multiply …” (Gen.1:28). God blessed you and Gary and the families. Dear Dorothy, It is an honor to share the Prayer Calendar each month. I am filled with joy knowing that you and others actually print it, use it, pray the prayers daily. As you and I know (because we’ve been Christians for a while…praise be to God!) our Almighty’s Alive God truly answers prayer. We’ve experienced it again & again & again. Oh, WOW, I am so touched by your comment about Gen 1:28 and my family. I hadn’t really thought about that. To God be the glory for the great things He has done in Gary and my lives and in our family’s lives. Prayers and blessings to you and Tony! Love and holy hugs.